A serene six-bedroom, old-world Sri Lankan home featuring Dutch-era inspired architecture Wijaya Giri is a colonial home close to Galle city and three famous surf breaks. With whitened walls and shingled roofs, this beautiful home is ideal for a family get-together as everyone can enjoy resting on the sun deck or splash around in the swimming pool. The bedrooms are comfortable, living areas and sitting room well-furnished, and the surrounding areas lend a resplendent view of luscious flora. It’s time for one of the most memorable trips in a surreal location in gorgeous Sri Lanka. Six bedrooms including a master suite are found at the villa with ample modern amenities including air-conditioning. The bedrooms are spacious, bright, and minimally designed accentuating the historical significance of the structure of the villa. The king-sized, four-poster bed in the master room is fit for royalty and so are four-poster beds of the other bedrooms. One of the bedrooms is furnished with two single, poster beds ideally suited for children. Each bedroom comes with its own en-suite bathroom with walk-in showers whereas one of the bathrooms even sports a sunken bath for a tranquil time. Amid lush, expansive lawns you will find the refreshing swimming pool at Wijaya Giri wherein guests can swim laps, enjoy the tropical warmth, and even play some water games with friends and family. There is a gorgeous pool deck with sun lounge for sunbathing and working on that sun-kissed skin for a luminous glow. Indulge in soothing meditation and yoga early in the morning on the garden where you have a yoga platform and meditation space. 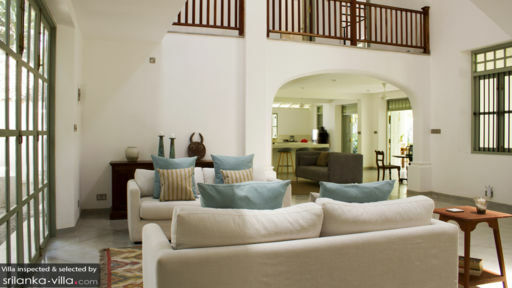 The villa even has a sitting area with a sectional sofa and it is open-plan overlooking the garden and pool so you can enjoy some fresh air while lounging. Wijaya Giri features a front patio with outdoor dining that allows you to bask in the most glorious view even while you’re digging into decadent Sri Lankan food or a continental breakfast. Through the glass doors, one can head inside to the luxurious and comfortable living area. The brightly-lit room is awash with sunlight and even has ample fresh air. Furnished comfortably, the living area is great to retreat to once the sun sets and you’re looking for some rest. Catch up with loved ones, play some games, enjoy a glass of house wine all while the serene ambiance keeps you company. There are plenty of options when it comes to dining as you can outside on the patio or in the living room. The fully-equipped kitchen is another spacious room with a breakfast bar and stools for a more intimate and casual dining setup also great for breakfast. The villa is your home away from home where you can do as you please with no tax on having a good time. Wijaya Giri is fully-staffed with a house manager to oversee the smooth functioning of the villa, housekeepers to look after the cleaning, and a personal chef who will prepare delicacies upon request. You can even ask for recommendations on how to travel and where to go as the staff will be happy to help. 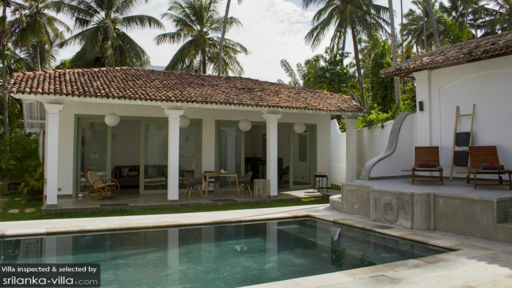 Wijaya Giri is located near the most popular spots in Sri Lanka including the historic city of Galle with its famed Galle Fort that was constructed in the seventeenth century. You can even explore inside the fort walls or roam the streets to take in the Dutch-era architecture. There are three surf breaks nearby as well for an adventurous day out on the beach.